LAWRENCE, Kan. – A season-high 13 3-pointers and an impressive defensive effort helped the No. 11/12 Kansas Jayhawks top No. 16/15 Texas Tech, 79-63, Saturday afternoon at Allen Fieldhouse. Redshirt-junior Dedric Lawson led all scorers with 25 points and posted his 15th double-double of the season, while freshman guard Devon Dotson added a career-high 20 points in the win. The victory moved KU to 17-5 on the year and 6-3 in league play, while Texas Tech fell to 17-5 and 5-4 in the Big 12. The Jayhawks were scorching the nets from the start as Lawson and senior Lagerald Vick combined to outscore the entire TTU squad in the opening half. KU connected on nine 3-pointers in the opening frame, with three each coming off the hands of Vick and Lawson. KU stormed out to an early 10-2 lead, fueled by back-to-back triples from Vick and freshman Ochai Agbaji, just over four minutes into the game. 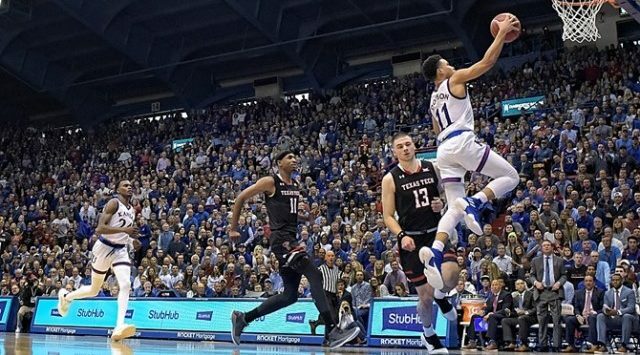 TTU managed to slow the fast KU start and cut its deficit to six points, 15-9, over the next four minutes, but the impressive Jayhawk shooting display continued. Vick splashed a pair of threes and redshirt-sophomore K.J. Lawson added one of his own to help the Jayhawk lead get to double-digits soon thereafter. Kansas headed into the final nine minutes of the opening half with a 26-15 advantage. Another 3-pointer, this time from freshman Quentin Grimes at the 2:36 mark, ignited a strong KU finish to the half. The Jayhawks outscored the Red Raiders 10-2 to help them head into the locker room with a 46-26 lead, TTU’s largest halftime deficit of the season. KU also held the visitors to 30.3 percent shooting from the field over the opening 20 minutes. The Kansas shooters cooled somewhat after the break but the Jayhawk defense still kept its strangle hold on the TTU offense. KU held the Red Raiders to just four field goals over the first seven minutes of the second frame, helping the Jayhawks keep the visitors at arm’s length. KU also suffered a drought on the offensive end, tallying only two field goals between the 16:26 and 10:00 marks. TTU used this to slowly cut into the deficit, trimming the KU lead to 59-46 with 11:40 to play in regulation. But the Jayhawks again responded, this time with a 9-2 run to snuff out the Red Raider momentum once and for all. Dedric Lawson and Dotson scored 17 of the Jayhawks’ final 20 points, all within the final 10 minutes of the game. Dotson’s 3-pointer with 3:51 to play in the game got the Jayhawks’ lead to 79-55, where they coasted to the 79-63 final score. Dedric Lawson led the Jayhawks in scoring for the 10th time this season, scoring 25 points and pulling down 10 rebounds to tally his 15th double-double of 2018-19. Dotson surpassed the 20-point plateau for the first time in his young KU career, with 16 of those points coming in the second half. Vick scored in double-figures for the eighth-straight game via his 13-point effort, while Agabji added the first double-double of his career, posting 10 points along with 10 rebounds. Kansas ended the day shooting 45.8 percent from the field and 43.3 percent from beyond the 3-point arc, which included a season-high 13 3-pointers. The KU defense held the Red Raiders to 34.4 percent from the field and just 21.4 percent from 3-point range.